This filter is pretty easy to attach to a lens and it makes normal color under water! You can choose GR type(for green algae fresh/salt water) or CY type(tropical blue-green water) by situation of the sea. 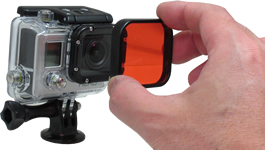 Compact design for compact Action DV Cam!! Shoe-mount for Mini-DV is built-in. 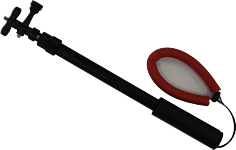 With Shoe-arm you can install lights and others simply and compact. Most of Mini-DV housing can be attached. 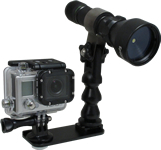 *To attached, it would need to prepare Tripod-adapter for GoPro. Simple package with LED light!!! 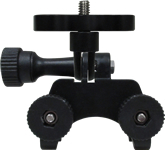 Clog-shoe Flex, Clog-adapter for EL1000 and Shoe-stay Mini. 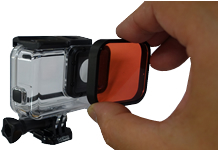 It can be attached directly with most of Mask and hose of Regulator to be installed to our eDivecam or GoPro HERO3. *This filter is only for "GoPro HERO5 Black Super Suit"dive housing.